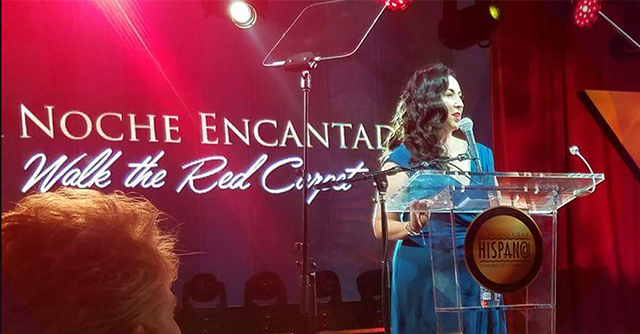 Michelle Hernandez, shareholder at Modrall Sperling, welcomed guests at this year’s La Noche Encantada, the annual gala hosted by the Albuquerque Hispano Chamber of Commerce. The 2018 was attended by a record-setting 2,000 people, with guests from across the nation. As this year’s Chair, Hernandez provided remarks, expressing thanks to supporters and outlining her vision for the Chamber: to promote economic development, support small, local, women- , minority-, and veteran-owned businesses, engage young professionals, and embrace diversity. She became the Chair of the AHCC in November, 2017, and has served on the board of directors since 2013. Founded in 1975, the Albuquerque Hispano Chamber of Commerce is New Mexico’s largest Chamber with revenues of $2.3 million at last recording.